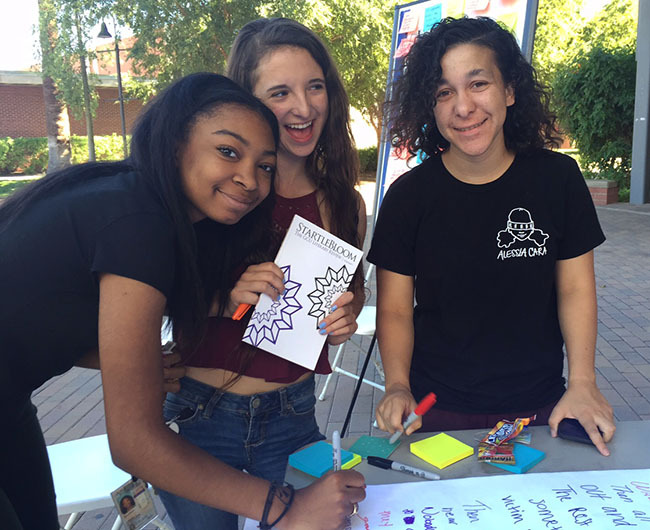 From the left, freshmen Jaenna Morgan, Nicole Shaheem and Naquia Varner add a line to a community story during National Day on Writing. 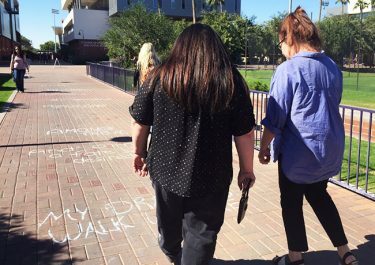 If Grand Canyon University’s National Day on Writing was a story, it would be filled with colorful characters, multiple plotlines and a happily-ever-after ending. College of Humanities and Social Sciences faculty members Heather Brody (left) and Dr. Diane Goodman read a chalk poem written by two student writers. That she used few words to describe the celebration of writing Thursday was a reflection of one of the fun exercises offered — writing an autobiography in six words. 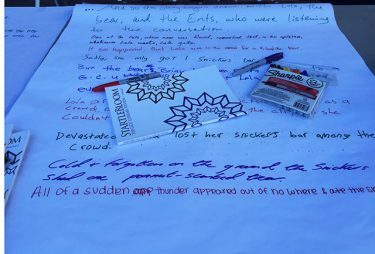 In a second activity, passersby were encouraged to pick up a red, green, yellow or blue Sharpie and add a new line to one of several “extenda-stories” being written by the community on pads of paper on two tables. A poetry reading was scheduled for later in the day. Those in more of a hurry opted to scribble down their six-word (well, approximately six-word!) personal stories on pastel Post-It notes they then affixed to two large bulletin boards for public consumption. Six-word autobiographies were part of the writing challenge. 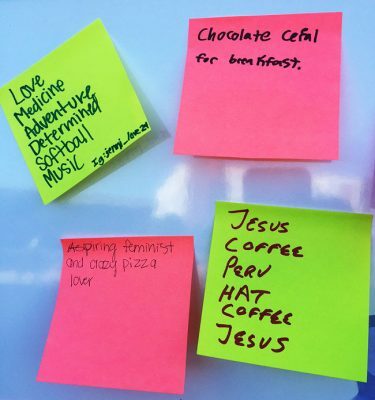 Brisa Castro, a freshman elementary education major, paused thoughtfully before jotting down her six words, then smiled serenely as she posted them on the board. “Broken home. Found God. Made complete,” she had written in a message both profound and concise. The first line of one extenda-story was, “They were lost,” followed by, “for five days in Disneyland”. The jumbo paper page was covered with multi-colored sentences by the time three freshmen — Naquia Varner and her friends Jaenna Morgan and Nicole Shaheem — showed up. The science majors turned to science fiction in two lines they added, invoking both Yoda and Darth Vader. Adding lines to community extenda-stories was part of the National Day on Writing fun. 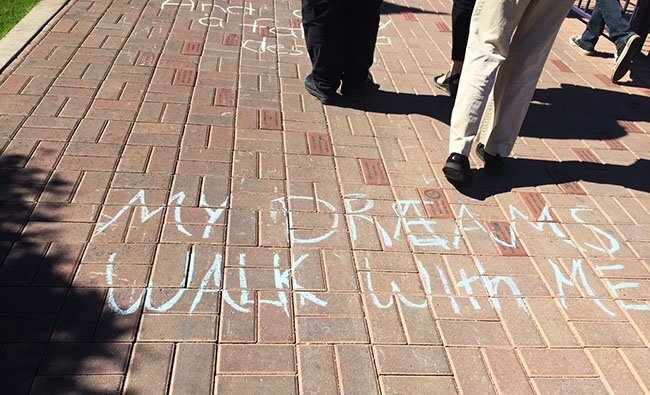 Senior Tim Dombroski and junior Cymelle Edwards used chalk on concrete to create two poems. One, written on a sidewalk, was about a journey, and the other, written on a stairwell, was about a climb. “I want to be a writer — I want to get my Masters of Fine Arts — and I’d like to be a professor one day,” said Edwards, who, like Dombroski, has had work published in StartleBloom, the GCU Literary Review. Among English faculty who participated in the event were Dr. Diane Goodman, Heather Brody, Maria Zafonte, Dr. Tom Skeen, Brian Raftery, Dr. Jen Santos and Dr. Jim Helfers.